To observe the earliest stages of star formation, astronomers combined the power of a natural magnifying glass in space, through a process called graviational lensing, with the human-built Atacama Large Millimeter/submillimeter Array (ALMA) and the European Space Agency's Very Large Telescope (VLT), both in Chile. Turning them toward the galaxy MACS1149-JD1, they observed the guts of the first stars, in the form of oxygen. "Usually, distant galaxies are very faint, but thanks to the gravitational lensing effect [light bending around an intervening galaxy], our target was bright," Takuya Hashimoto, an astronomer at Osaka Sangyo University and the National Astronomical Observatory of Japan, told Space.com. Hashimoto, the lead author on the new research, presented the results at the semiannual winter meeting of the American Astronomical Society in Seattle in January. 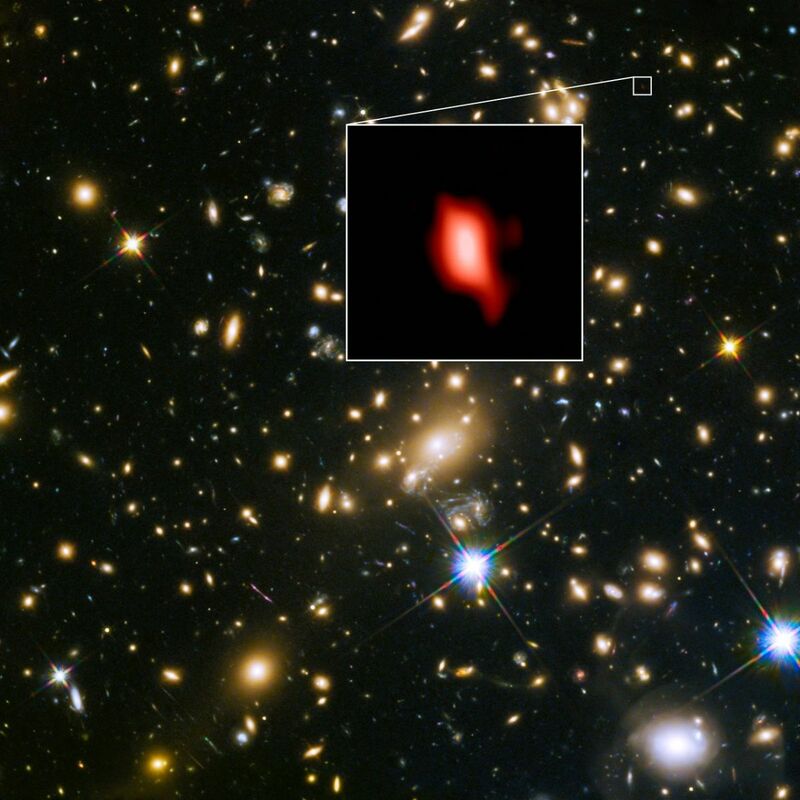 "This is one of the earliest star-formation events found in the universe," Hashimoto said. The first stars formed primarily from hydrogen, the element that dominated the universe right after the Big Bang. Like their descendants, these stars were element-making machines, building new elements in their hearts as temperatures and pressures increased. When these stars exploded, after only a short lifetime, they scattered the newborn elements into the space around them, allowing the next generation of stars to incorporate that gas and dust.